In the previous post, I looked at the influence of different recovery styles. Now, it’s time to look at the influence of the force profile during the stroke. I varied the force profile of the applied force during the stroke, keeping stroke length constant, and scaling the maximum force such that the average handle force per stroke remains constant. Figure 1 shows the different force profiles that I tried. The system used for the simulations was a single scull with a 80kg rower and fairly standard rigging. Catch angle -63 degrees, finish angle 43 degrees (zero being sculls perpendicular to the boat’s long axis). Figure 1 shows the various stroke profiles that I tested. I used extreme, unrealistic profiles on purpose. We’re still in validation mode so consider the results more as a test of the simulation than an exercise using realistic stroke profiles. No sculler will be able to pull a force profile like “strong finish” in figure 1. Once we have confidence in the simulations and a feeling for the error margins, we can look at realistically achievable force profile variations. Figure 2 shows the results. As said, I kept the average handle force per stroke constant and increased the stroke frequency from 25spm to 35spm for the five different force profiles. The duration of the stroke is a function of the force profile and of the boat velocity at the catch, so the recovery speed, or ‘the rhythm’ will be different for the different rowing styles, even when rowing at the same stroke frequency. 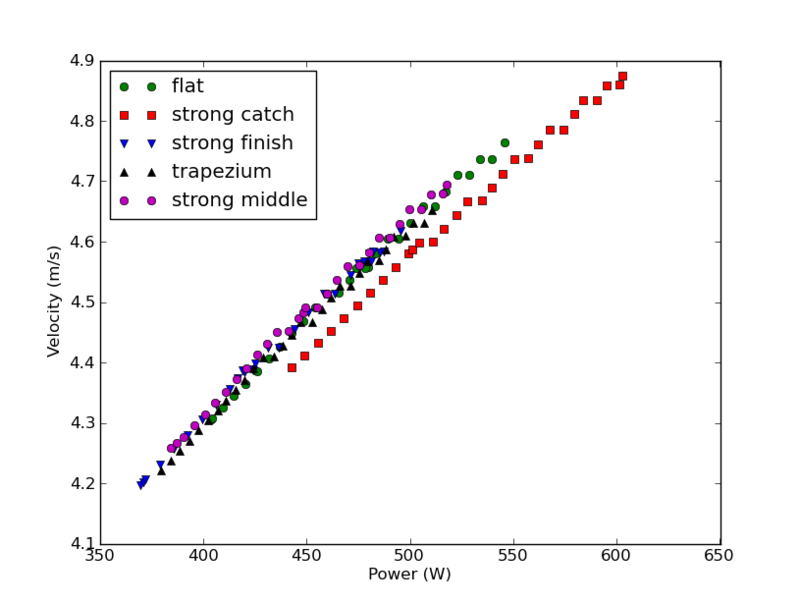 Interestingly, all force profiles except “strong catch” seem to fall around a common Power-velocity curve, although the stroke frequency needed to achieve a certain power varies. 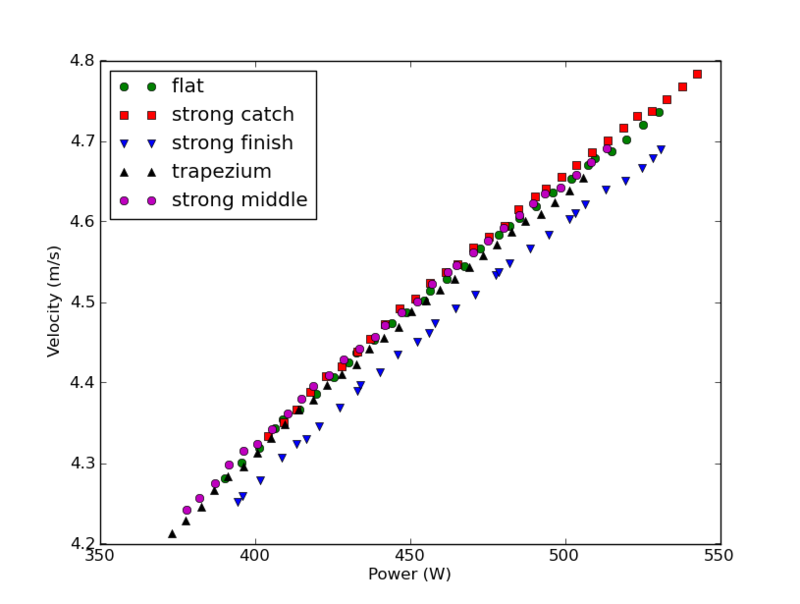 Apparantly, some force profiles are “heavy” strokes where the rower achieves a higher average power with a lower stroke frequency. It’s a bit puzzling to me to see such large differences in power at the same stroke frequency for the different force profiles. My working assumption right now is that the constant average handle force in figure 1 is really a “stroke length average” and not a time average, but I am not 100% sure that this is the right explanation. I need to dive into my model to find the explanation. The “strong catch” curve is the outsider. Higher end speeds are achieved, at relatively low frequency, however at the cost of much higher power. So, is this a “heavy, inefficient” stroke? The equations for drag and lift are symmetric around the 0 degree oar angle point. However, the scull arc in my example is not symmetric around 0. So, I performed an additional set of simulations where I moved the foot board towards the bow in such a way that the catch angle is now only -43 degrees and the finish angle is 63 degrees. The results can be seen in figure 3. Indeed, the “strong finish” stroke has now become the most inefficient one. Looking at Van Holst, figure 4.3 here, the cause of this is that the rowing is pulling hard in the part of the stroke where the blade efficiency is low. 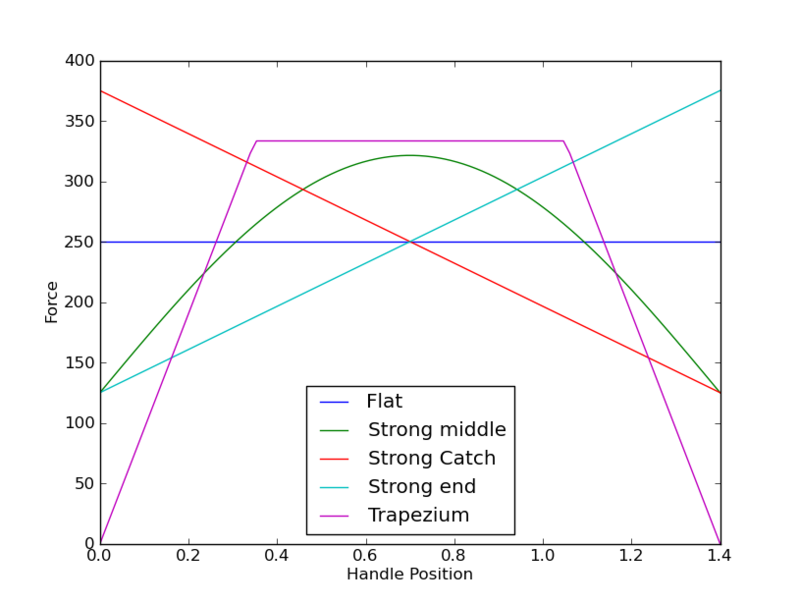 We’ll look at this conclusion again in a subsequent post on catch angle dependence. Note to self: In another subsequent post, I need to look deeper into the power differences for the different stroke force profiles. This entry was posted in rowing physics on October 27, 2010 by sanderroosendaal.